Hot on the heels of a fervent nationally-broadcast nosepicker, a BYU fan is running with the nostril-spelunking baton. Last night's NIT bout in Provo between the Cougars and Washington turned out to be a snoozer, but even early on this gentleman was more interested in his own sneezer. This is a Deadspin Video, in which strange sports moments are slowed down to ridiculous speeds and matched with indie music. 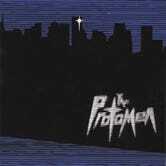 This video features "Hope Rides Alone" by The Protomen. See previous episodes here.